Howmore is a gem of a place, one of the highlights of any visit to South Uist. One of its most important attractions is also one of its least obvious. 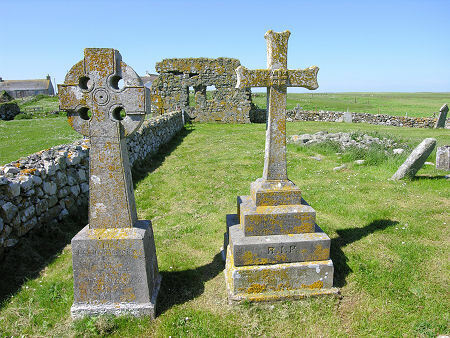 Two hundred yards north of the road, and a little north east of the crofters' hostel are a series of ruined churches and chapels that once made this a highly significant ecclesiastical site. The ruins lie on ground that lies slightly above the surrounding area, and in early times this would probably have been a virtual island, surrounded by marshland. If you take a direct line from the road to the ruins, rather than going via the hostel, it soon becomes clear that some of the marsh remains. Working out where one building ends and another starts is difficult. 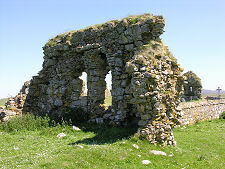 Further confusion is added by the presence of a stone wall that surrounds part of the area, doubtless constructed of stone that came from one or other of the earlier buildings. This defines a sparsely occupied graveyard that occupies much of the area of the complex. Disentangling the picture is made more difficult by the presence of two walled burial enclosures in the graveyard. One fairly complete structure lies totally outside the walled area. 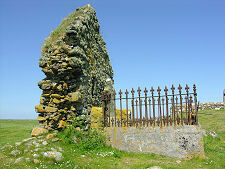 This is the Caibeal Dubhghaill, Dougall's Chapel, measuring just 5.2m by 3.5m. More striking is the large gable containing two windows that lies to your left as you go through the gate in the wall. This was once the east gable of the Teampull Mor, also know as St Mary's or the Large Church. The church measured some 20m by 8m and extended in the direction of the hostel from its still standing gable. The gable that stands in the centre of the walled area was once the east (or far) end of the Caibeal Dhairmaid, St Dermot's Chapel. This was some 5.7m in width, but was of unknown length. 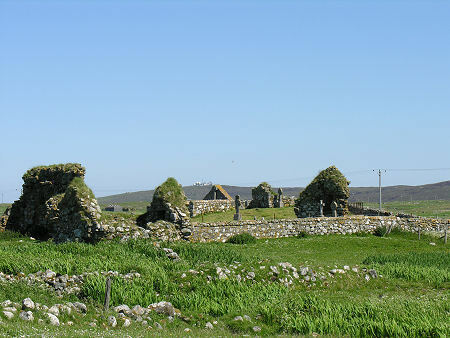 It was certainly the second largest building in the complex and is the reason why there are often said to have been two churches and three chapels at Howmore. The remaining two chapels stood at the upper, north east, corner of the walled area. 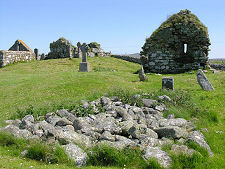 One was demolished in 1866, but the walls of the other, the Caibeal Chlann 'ic Ailein, Clan Ranald's Chapel, still stand. 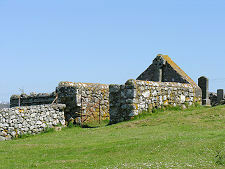 Clan Ranald's Chapel probably dates back to 1574. 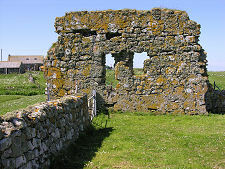 Dates for the other buildings are unknown, though Teampull Mor may have origins as early as the 1200s. 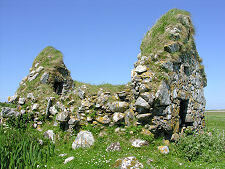 Until it was stolen in 1990, Clan Ranald's Chapel was home to the Clan Ranald Stone. After the stone was recovered in London five years later, it was put on display in the nearby Kildonan Museum. 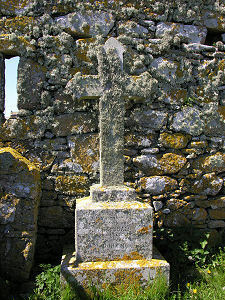 From the evidence of the gravestones on display, the Teampull Mor complex was never hugely in demand as a last resting place. What seems to be the most recent grave is also the most poignant. Outside the walled area and a little way back towards the road is a simple wooden enclosure. 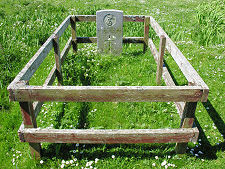 Within it lies a military headstone commemorating "A Sailor of the Great War - Royal Navy". "A Sailor of the Great War"